I used to think The Beatles were overrated. While growing up, their name popped every time I read about my favorite artists’ musical influences, listened to “best of” musical countdowns on the radio or watched a documentary about the history of rock and roll on TV. My parents raved about The Beatles during their early college days at Ohio University in 1964-1965. The songs “I Want to Hold Your Hand,” “Can’t Buy Me Love,” “A Hard Day’s Night” and “Eight Days a Week” served as the soundtrack of their transition from youth to adulthood. Anytime The Beatles were mentioned, my parents fondly recalled dancing to their songs at college mixers, watching them play on “The Ed Sullivan Show” and getting excited about the British Invasion. “Dad, Were The Beatles really that big of a deal?” I asked. “L, They were a big deal. Everything changed overnight here when they played ‘The Ed Sullivan Show.’ Before The Beatles came here, all that boring folk music was popular. That stuff put me to sleep,” he said. At the time, I attributed my dad’s admiration of The Beatles simply to nostalgia. Like most teens and young adults, I thought the artists of my parents’ musical heyday were passé and overhyped. What I didn’t realize was The Beatles laid the musical groundwork for so many emerging artists at the time – The Dave Clark Five, The Spencer Davis Group, The Kinks, The Who and many others – and inspired a fascination with mop-top hairstyles and Swinging London. The Beatles also sparked musical fires in many artists I admired while growing up, including Heart, Phil Collins, Billy Joel, U2, Bruce Springsteen and countless others. Many artists have talked about watching The Beatles for the first time on “The Ed Sullivan Show” on Feb. 9, 1964 and wanting to become musicians after that. Most of those budding musicians went out and bought their first guitars after witnessing that landmark TV performance. It wasn’t until 45 years after that landmark TV performance that I became a Beatles fan. In 2009, I discovered a hidden passion for music, vinyl and concerts at age 33 and started exploring different artists and musical genres. One of those artists included The Beatles. 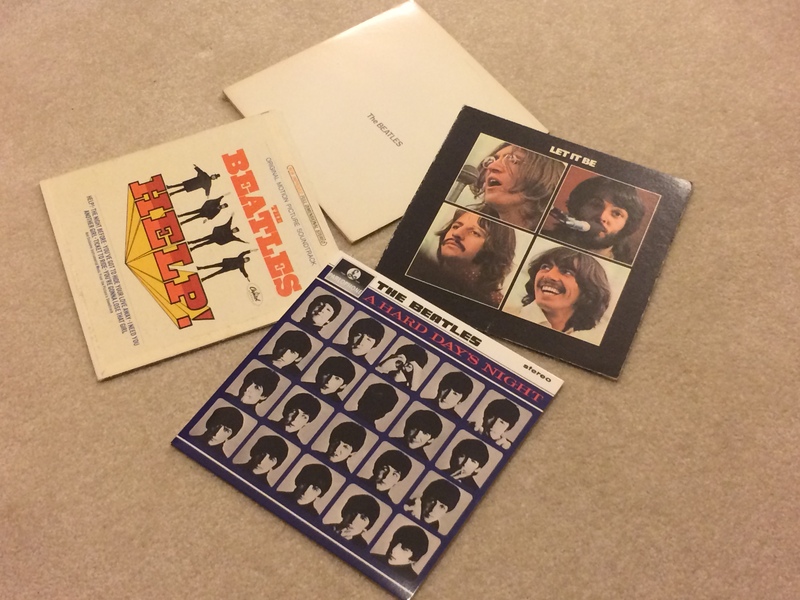 A sample of Beatles’ albums from my vinyl collection. At the time, The Beatles original stereo recordings were remastered and reissued as a boxed set compilation and as individual albums. I went out and bought all the individual albums from “Rubber Soul” to “Let It Be” on CD and some on vinyl. Those songs played throughout my childhood and teenage years without me even knowing it. I can’t even begin to count how many times I’ve heard those songs in commercials, TV shows and movies. I began to develop a true appreciation for “the artistic” phase of The Beatles’ music. In other words, that phase, circa 1965-1970, includes their more experimental work with philosophical lyrics, new instrumentation and avant-garde musical styles. They were simply transitioning from pop craftsmen to true musical artists. That “artistic” phase mirrored my growing taste in indie rock, independent films, theater, comic books, science fiction and fantasy, vinyl records and concerts. If it weren’t for The Beatles, I wouldn’t have developed such a diverse entertainment palate that whetted my appetite for more creativity and individuality. Taught by Professor John Covach, the class covers the band’s beginnings in Liverpool and Hamburg to Beatlemania and psychedelia to Abbey Road. He does a superb job highlighting the history of different songs, albums and musical approaches. In particular, I enjoy learning about The Beatles’ song structures and how they introduced sitars, fuzz basses and harpsichord solos into their music. The best part is listening to The Beatles’ songs and albums along with each week’s lessons. Now, I can connect the musical dots as I listen to “A Hard Day’s Night,” “Revolver,” “Sgt. Pepper’s Lonely Hearts Club Band” and “Magical Mystery Tour.” Years from now, new fans will discover the timeless, likeable quality of the Fab Four’s discography and pass down that appreciation to new generations. In a sense, listening to The Beatles allows me to imagine what life was like in the 1960s when my parents went to college, got married and started their first jobs. The older I get, the more I appreciate my family and how the passage of time has shaped them. Now, I can honestly say I have become my parents in a sense. Sometimes, it takes age, experience and time to see life through your parents’ eyes. Luckily, I’m enjoying the early days of The Beatles and understanding what all the fuss was about. As my dad famously says, heredity is a terrible thing. In this case, it couldn’t be further from the truth.